Amanda Ripley is quite possibly the unluckiest woman in the entire galaxy–possibly even more unlucky than her mother, femme fatale and alien flayer Ellen Ripley. What she lacks in the vast pantheon of sky wizards trying hard not to kill her, the young Ripley more than makes up for in tenacity, brass resolve, and a background in turning ordinary household objects into things that explode. 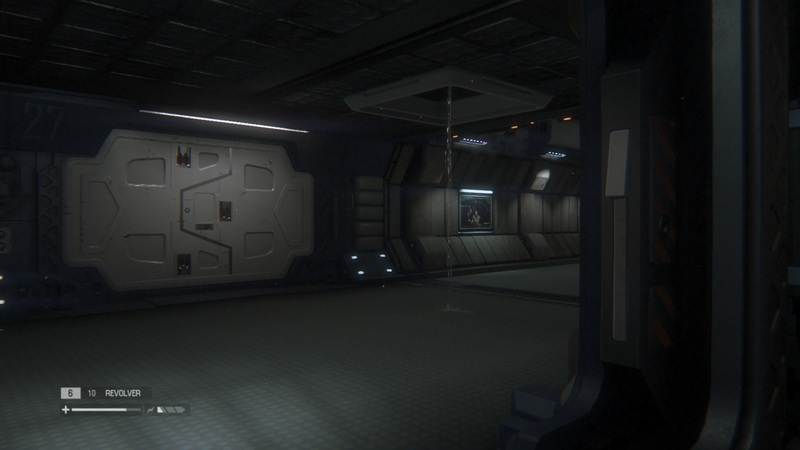 Right from the beginning, Alien: Isolation had a Colonial Marines-shaped cross to bear. Even the promise that Isolation would return to the Alien franchise’s horror roots wasn’t enough to quell the penny-flavored tang of general misgivings. Developer The Creative Assembly’s previous endeavors had largely leaned toward strategy gaming–another cause for skepticism by some. Perhaps the obviousness of the franchise’s next step was to blame. A slow, atmospheric survival game centered around being hunted by one of science fiction’s greatest abominations: why hadn’t anyone thought of this sooner? And though the consensus on this game is a fairly polarizing one, I found Alien: Isolation to be just the patient, subtle itch of spine-melting queasiness that only the best horror can provide. Hell, they had my heart racing at the mention that the glorious Dan Abnett was one of the three writers who penned this particular shoes-two-sizes-too-big-to-be-filled-by-almost-anybody entry in the Giger-inspired world of madness that is Alien. A madness where things tend to chew on your face. Seriously: stay away from the drooly vents. Alien: Isolation takes its time. More than that, it takes long, languorous steps. Steps that are perverse and filled with shadows and something inexplicably gorgeous and something primal and afraid. Before going any further, it’s important to point that out. This is not a run-and-gun. This is not the screeching jump scares of Five Night At Freddy’s. Nor is it the ripping, tearing, maw of Texas Chainsaw Massacre. Isolation is slow and atmospheric. You’re not playing a badass marine with a machine gun–you’re not a moody, misunderstood loner with an endless belt feed of ammunition and a chip on your shoulder. You’re an engineer. Amanda Ripley. Who has volunteered to join a doomed mission to retrieve the black box of a lost ship, the Nostromo–quite possibly her mother’s last words and the only clue she has to her fate. The fear that accompanies this search for a loved one follows you throughout the entirety of the game. It paints itself on the walls–it taps chisels into your breathing as you join Amanda in holding her breath in order to avoid detection. 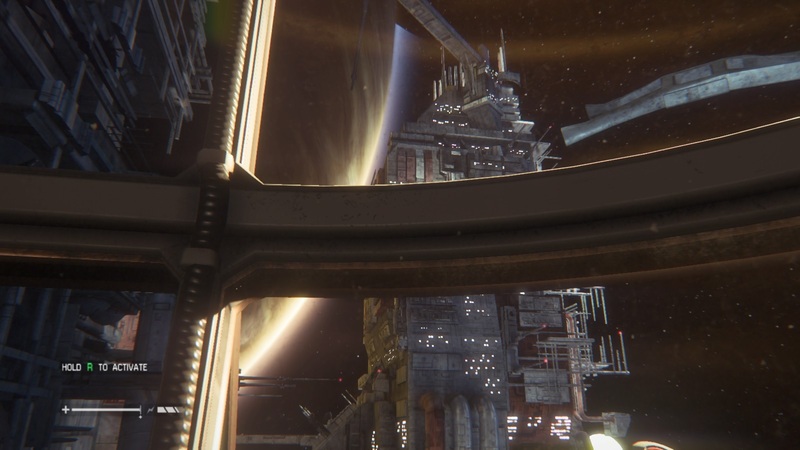 Alien: Isolation takes place on Sevastopol, a massive space station that, through the corruption of bureaucracy and the neglect of the bottom dollar, has been abandoned. As you peel back this ghost ship’s many layers, you uncover the truth about your journey, your mother’s journey, and the evils of humanity. Those few remaining residents in Sevastopol live in paranoid fear of both the malfunctioning, second-rate androids known as Worker Joes, and something more terrifying and predatory. I’m talking, of course, about the Xenomorph–the nightmare-fuelled monstrosity that stalks the corridors and shades of Sevastopol: killing indiscriminately and forcing you to find safety under tables, behind gurneys, and inside of storage lockers. Believe me: by the end of this game, you will be thrilled that the designers of Sevastopol’s interior determined that so many lockers were necessary. You spend the vast majority of Alien: Isolation hiding, creeping, and avoiding direct conflict whenever possible: it’s not unlike your freshman year of high school. The paranoia and fear is injected into you very early on. There were several moments in the game that I spent creeping and going as slowly as possible, when really there was no need. You’re not always hiding from death, but damned if you’ll be able to draw a distinction between safety and certain doom. Your paranoia is that palpable. It’s this paranoia that makes you remember the fact that this game is true survival horror. As you make your way through the many floors and sections of this space station, you pick up scrap and wire along the way, using blueprints to translate these innocuous materials into jerry-rigged devices that could buy you the extra seconds you need to escape from something that is biologically built to reduce you to a broken puppet. You are not an aggressor in this world–you are a scavenger. You are not in control. And that’s where much of the fear comes from. A huge amount of credit for the game’s scuttleskin atmosphere is due to the its sound design. It is basically flawless. Most game developers in this day and age take pains to market their work with screenshots and flashy animations. But to fully appreciate Isolation‘s jittery smoothness, you need a series of high quality audioclips. The constant, metal creak of Sevastopol’s rotting structure. The thud and thump of something making its way through the vents above you. That’s not to suggest that the game doesn’t have gorgeous visuals: it absolutely does. The “retro-future” aesthetic of Isolation puts you right into the universe. It’s a Throwback Thursday to a Thursday that we completely fabricated. One where interstellar travel and cassette tapes held hands and probably made out under the bleachers: truly bizarre and a lot of fun. What’s more, the visuals are unabashedly beautiful. You find yourself crouched over, sneaking along deliberately, conscious of every footfall you make. And then a series of shutters slide open, revealing the swirling clouds of a nearby gas planet. The twinkling stars only serve to italicize your isolation and loneliness, but you can’t help but notice how shimmering and rapturously endless this vast emptiness is. It is stunning. “Now they’re just showing off,” you mutter, on your way to be chomped on by the Xenomorph for the fourteenth freaking time. Gorgeous spacescapes to admire while you contemplate your inevitable death. The narrative is equally stark and alluring. As the story unravels, you find yourself following a plotline of betrayal, bureaucracy, and real human fear. Realizing that you are far from the only person to encounter the Xenomorph is compelling and frightening, even if you’ve already familiarized yourself with the source material of the franchise. If anything, those already familiar with Alien will find themselves even more chilled by the revelations found in Sevastopol. Even if Amanda Ripley isn’t quite as compelling as her source-material mother. That’s not to suggest that I don’t like the “new” Ripley. I do. It’s true that she isn’t as fleshed-out as many other protagonists we’ve played in the past, but when has that stopped us from loving any of the delightful denizens of video game history? Amanda Ripley is trying to survive, and we (as an extension of her) are as well. So how important is it that I know what her favorite color is? Her brave need to face the unknown for the sake of her lost mother is good enough for our current purposes, coupled with the fact that she is smart, capable, and cool under pressure (barring the occasional gasp of terror, of course). I don’t think it is. Not really. “Padding” is the wrong adjective for it, at least. It implies that the storyline was made longer just for the sake of length. 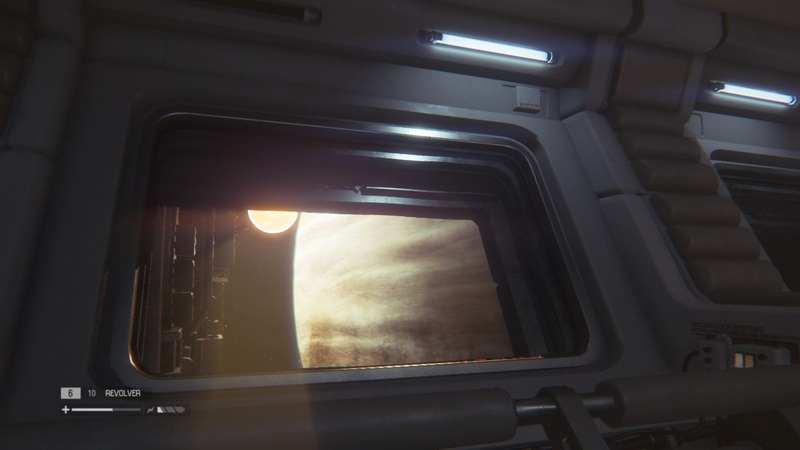 And while Alien: Isolation does feel a touch overlong, I have to believe that it was out of creative zeal instead of corporate weights and measures that allowed that feeling to sink in. 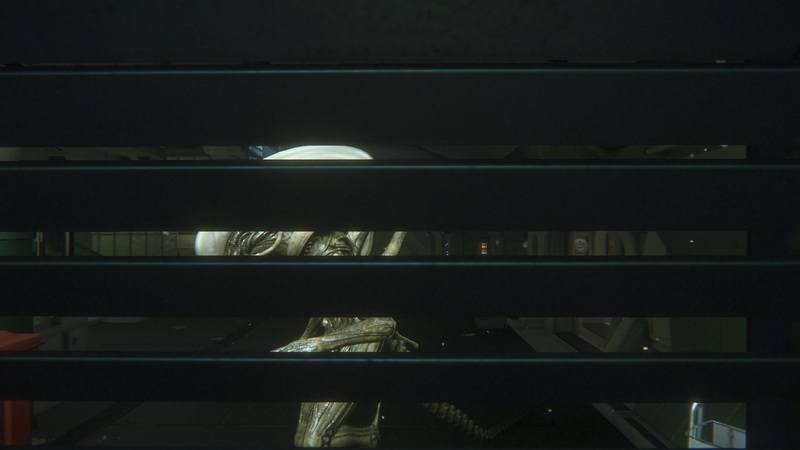 Beyond these minor clucks of the tongue, I found that Alien: Isolation was a massively worthy execution of the Alien franchise in video game form. And furthermore, were they to make a sequel with the same delicacy and care, I might be willing to forgive Sega and Creative Assembly for the brown stains that are presently doing irreparable damage to my desk chair. Because I suppose what makes me appreciate Alien: Isolation is the very same thing that made me appreciate Ridley Scott’s Alien, and, to a lesser extent, James Cameron’s Aliens. Beyond the visual beauty and terror that the franchise evokes, it’s actually a very existential piece. It’s very much about the frailty of humanity on the whole as it ventures into the unknown. The fact that no matter what innovations we come up with, no matter how many toys and technical gizmos we develop, we’re still very frail creatures of water and meat spiraling through time and space. And when nature and the vast void of the universe has its say, all of our toys cannot protect us from the evil outside. It’s that primal fear that makes me love what The Creative Assembly has done with Alien: Isolation. It is stirring and it is absolutely worth playing. I hope that we will continue to see such remarkable works from this franchise in the future. COMING SOON: My release date review of Citizens of Earth! Be sure to follow me on Twitter and Subscribe for more overthought gaming gloriousness! ← More GW News: Battlefleet Gothic Coming Soon To Exterminatus Your PC! I just can’t fear the xenomorph, then again I have generally had an issue with finding a lot of horror monsters scary, I just kind of mock them out of instinct because they can be duped so easily in a video game. I’d turn the difficulty up but then I could swear doing so makes the enemy AI into a god. Nah, it is rather easy on all the difficulties apart from the highest when it just SWITCHES on me and turns into a goddamn homing pigeon….with acid blood.